"Food bank" has become a household phrase. One uses it to describe their neighborhood community center that gives food away to those in need. We use the phrase to describe our church or synagogue that asks us to donate a bag of groceries. A food bank, however, is a lot more than that. A food bank is the center of food collection and distribution in a community. This food usually comes from grocery stores or manufacturers that have thousands of pounds of food to give away. Food that would have otherwise been thrown away. (The United States Department of Agriculture estimates that 27% of the food served in this country is wasted.) In essence, food banks operate intricate and advanced warehousing operations, where food is collected, sorted and re-distributed to the community. Traditionally, a food bank does not distribute food directly to those in need. Instead, food banks serve an extensive network of organizations in their respective communities. These organizations serve one part of the community and know the needs of the people there. Therefore, working together, the food bank and the community organization can serve a greater number of people in the most efficient way. The Northern Virginia branch of the Capital Area Food Bank. Food banks are the center of food collection and distribution for poor people in a community. The Capital Area Food Bank that serves the Washington Metropolitan area operates a 48,000 square foot warehouse in Northeast Washington and a 16,000 square foot warehouse in Northern Virginia. 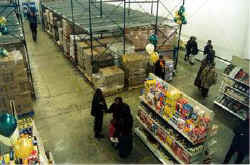 More than 600 community organizations form the Capital Area Food Bank's network, which distributed 15 million pounds of food in 1998. Not only is food provided, but an organization that saves money on food can use its surplus cash to provide more services to its clients. Many food banks provide other services. The "direct service" that food banks provide is varied throughout the 188 food banks that are part of the national Second Harvest Food Bank Network. They range from after school feeding programs, including Kids Cafe, to community agriculture projects. 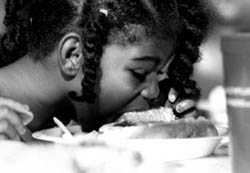 Child eating at a Washington, D.C. feeding program. The Capital Area Food Bank's Education department reaches thousands of Metro area residents each year in various capacities. The Work Experience Program is providing work experience to DC residents that have been labeled "hard to employ" and whose government benefits under TANF will not be available to them much longer. In the aftermath of Welfare Reform, this is a desperately needed service throughout the entire Metro area. The Capital Area Food Bank also funds an organic farm project, From the Ground Up; two nutrition education programs, Foods & Skills and Operation Frontline and the national after school feeding and education program, Kids Cafe. In the aftermath of welfare reform, food banks throughout the country are raising private funds to operate innovative programs and to feed those who are hungry. Every food bank strives to be a hunger advocate, producing hunger studies and tracking statistics, while lending their hands-on expertise to get legislation passed and ensuring that the issue of domestic hunger is not lost in the shadow of an "economic boom." "There's a spiritual quality about food," says Lynn Brantley, Executive Director of the Capital Area Food Bank. "When you don't have enough, it's devastating, not just nutritionally but spiritually." Graham was associated with the Capital Area Food Bank when she wrote this article.